It's Labor Day today. A holiday devoted to honoring the working people in the US and Canada. We think this holiday should be extended to our furry working friends too – from animals that serve in our military and help keep us safe to therapy animals who bring joy, compassion and smiles to people who really need them. It's our honor to introduce you to a very special friend of ours – Spaghetti Bob. Some of you regulars here may know him as my *boyfriend. * But Bob is much, much more. He's a Registered Therapy Cat. We originally met on Facebook and learned that we were neighbors. The friendship (and the romance) blossomed. We thought it would be fun to interview Bob today so that you could get to know him too. KATIE: Hi Bob. *blushes* Thank you for letting me introduce you to my friends today. 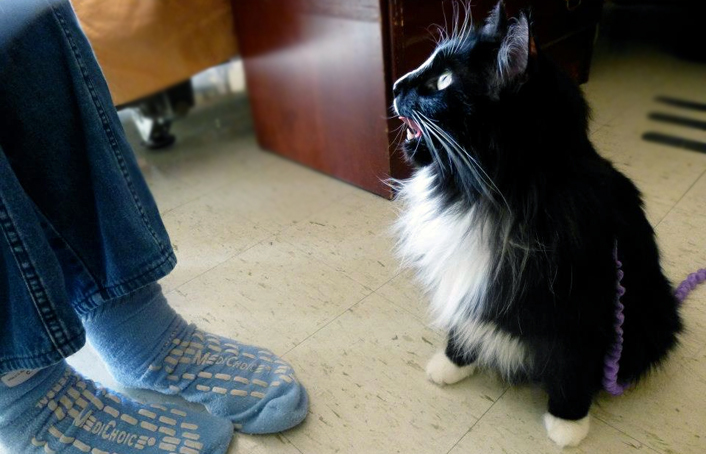 I bet everyone would love to know what kinds of things you do as a therapy cat. SPAGHETTI BOB: Thank mew, my lub. I'm very happy to be here. 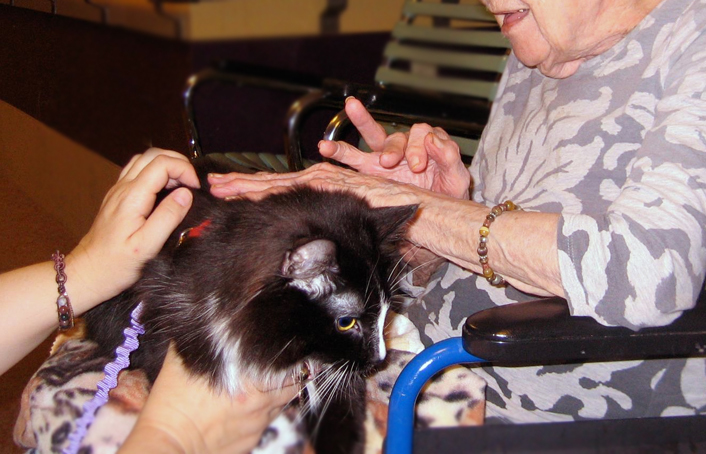 When I'm on a therapy visit, I walk around nursing homes and let people pet me. Sometimes I let them hold me too. Sometimes it can be a bit stressful, but the people are so happy to see me and even those who report not liking cats smile when they see me. KATIE: Smiles are good, Bob. We specialize in smiles here. KATIE: Awwww, Bob. I bet it's very rewarding, being a therapy cat. What do you love the most? SPAGHETTI BOB: The best part is all the positive energy I feel and getting to go out of the house to see all sorts of new and wonderful things and people. Flirting with nurses is great too! Er, I mean, um... I like making the staff's day brighter too! KATIE: Phew! Well just as long as you're not flirting with any other ladycats! SPAGHETTI BOB: I only have eyes for mew, my lub. KATIE: So Bob, I know that you are a *registered* therapy cat. What kind of license or documentation do you have? And did you have to take any tests? SPAGHETTI BOB: I'm registered through Pet Partners, formerly Delta Society. They are a national organization that registers many species, such as rabbits, cats, dogs and guinea pigs. I needed to be checked for parasites, viruses, etc and be current on all my vaccines. Cat's don't need to take a class or anything but must pass an evaluation. You and your human partner are tested by being presented some challenges you may see on a typical visit, such as: rough handling, noises, toys and dogs. The human's main job is keeping you safe! Trust me... that's important, as it really is a partnership. KATIE: Does is matter how old or young you are? SPAGHETTI BOB: You must be at least 1 year-old to register and it's probably easier to work with younger cats, but you can register as an older cat too! KATIE: Bob-dear, where can people go to learn more? 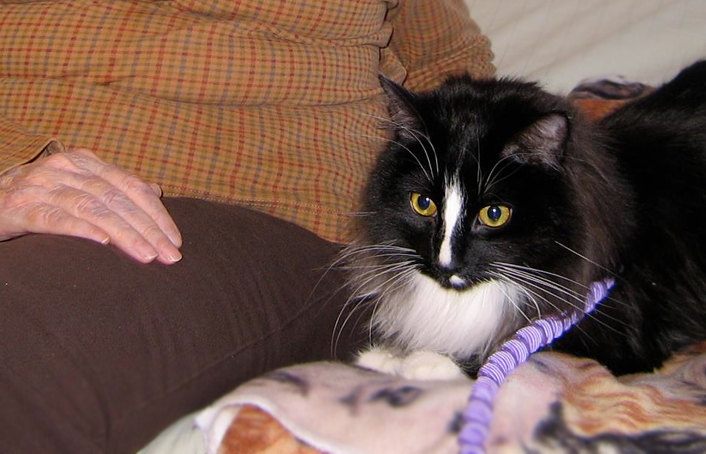 SPAGHETTI BOB: Well certainly the best unofficial resource would be the Therapy Cats Facebook Page I just started! There are several organizations throughout the US, but Pet Partners is probably the largest and they only have 179 registered cat therapy teams! I would recommend looking at their FAQ section here: Pet Partners FAQ. KATIE: Thank you SO much for mewing with us today, Bob. And thank you for all the love you spread. Is there anything else you'd like to share with us, Bob? 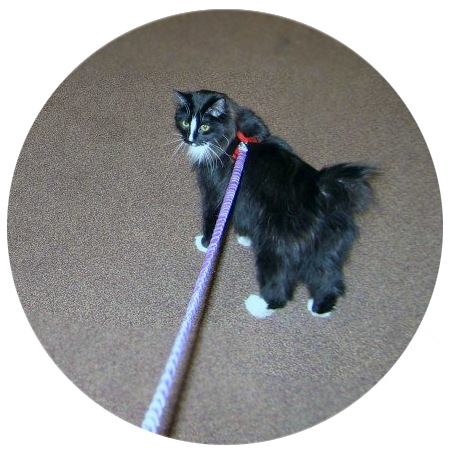 SPAGHETTI BOB: Harness, leash and clicker training are things that everycat can work on with their human! There are so many adventures our humans can take us on! All photos courtesy of Spaghetti Bob - Registered Therapy Kitten. Oh Katie, he is most handsome and a purrfect compliment to your beauty! Oh Katie, Bob is so handsome. The work he does is very impawtant and he touches so many lives. We love Spaghetti Bob and know him on Facebook so thrilled to learn more. Happy Labor Day from our four hard working boys and one lazy mom. Youz a good mancat, Mister Bob. Hey I didn't realize - are you a bob-tailed Bob? Awwwww gorgeous Katie!! Your mancat is totally ADORABLE!!!!!!!!!!!!!!!!!! We see why you lub your boyfriend! He's sooooo sweet! He has a big heart! At this time our mommy is able to visit a nursing home once a week to help with music & devotions. It's so rewarding hearing them sing & seeing them smile. Have a great week! Spaghetti Bob certainly is an amazing cat to spread all that joy and happiness. Therapy cats are amazing. Thank you for this wonderful portrait of Spaghetti Bob. Happy Labor Day to all of you! Spaghetti Bob is very cool! 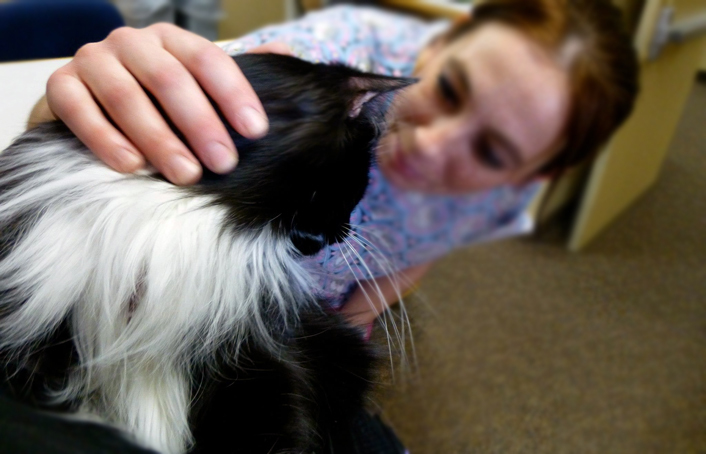 Therapy cats have an important job and make a big difference. Way to go, Spaghetti Bob! What a hard worker Spaghetti Bob is. We love him...well, maybe not the same way you do, Katie...and all the good work he does. HAPPY LABOR DAY TO ALL OF YOU and thank you for this great post! When my father-in-law was in a nursing home with alzheimer's before he passed, they had cats who actually LIVED in the Nursing Home. The benefits for the patients were worth more than any money or medicine could buy! I had no idea that your boyfurriend Bob worked as a Therapy Cat. It´s great that you even have organizations for them in the States. Wish we had that in Sweden too ! I used to go with my mom to her work when she worked evenings and it was very much appreciated. Can you imagine there was older people that haven´t patted on a cat for 10 years !! Aww, isn't he handsome! And what a hard worker! Very sweet, you picked well, Katie! Katie he sure is a handsome. What a great post. Used to work at Assisted living for the elderly and it would make their day when someone brought in a dog or cat. One time we even had a baby goat. The smiles on their faces were priceless. One of the things Mommy fears (and there are many) is getting old and not being able to have a pet. Hurrah to your lub, Spaghetti Bob! My gosh Spaghetti Bob has an important job. All those peeps needin' his love. WONDERFUL! What a handsome boy who really does good work it putting a smile on faces that don't have much to smile about. Great intervue Katie. Bob is sure one special mancat and what he does for all of those people is indescribable. Thank cod for working cats like Bob. What a handsome kitty he is too. But then Momma has a very very soft spot for tuxies. You are rockin' it Spaghetti Bob! Such an impawtant job you have!!! Spaghetti Bob is so awesome! My human has always wanted a therapy cat, but none of us have the temperament. Not even Binga - she is only friendly at home. When she is taken elsewhere she gets skittish. What an honor to have him as your boyfriend! Mommy has yet to meet a therapy cat for real. She has seen and met a few therapy dogs. There was one who she used to see at her old community center. He owned one of the employees there and she loved taking him to work with her and sharing him when he wasn't working himself. Lots of kids and adults loved playing frisbee with him! Including Mommy! 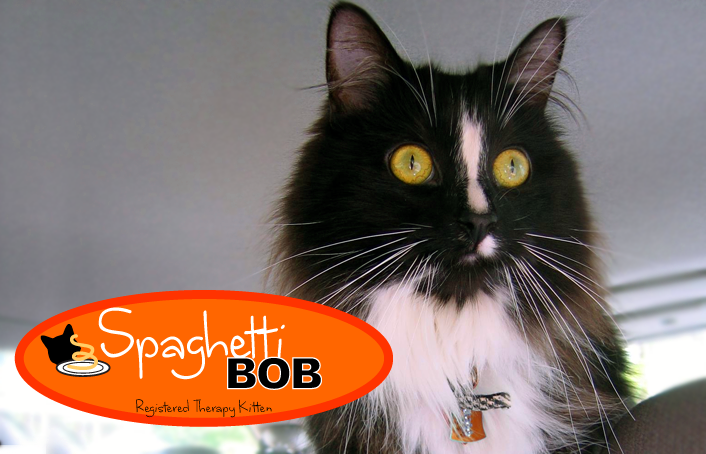 Paws up to Spaghetti-Bob! Our Tabby is friends with him on FB, as is Mommy. He and his mommy do such awesome work, and really spread the word on what being a therapy cat is all about! Great interview, Katie! WHAT a joy to read. I love Bob and I respect that he is yours, Katie. But I think he is such a handsome dude and so good. Bless his heart and his human's too. Aw what a fun job Bob has! Great interview Katie. Glad to hear more about your kitty boyfriend. Happy Labor Day! I really enjoyed reading about Spaghetti Bob! I'm sure he makes so many people happy! We love Bob, he's a real hero! Although Bob IS a hero, this is a great way to rid of that little orange thing......a job! Bob is sure cute and sometimes he talks with me on FB. He must have some calm purrsonality to do that line of work. Has he ever came over the visit you and Waffles?